CalNaturale is the first-ever national consumer brand launch from California Natural Products, a leading all-natural food company whose mission is to improve the health and wellness of consumers by offering better tasting, nourishing and convenient foods at a great value, without compromising on quality or the environment. CalNaturale Svelte is a multi-functional, all-natural sustained energy protein beverage dedicated to providing great taste, positive nutrition and increased vitality through pure and simple ingredients. Made with organic and all-natural ingredients, Svelte is also non-dairy, cholesterol-free, certified gluten-free and certified kosher. It offers a natural alternative to other sustained energy, protein and meal-replacement beverages in the marketplace. 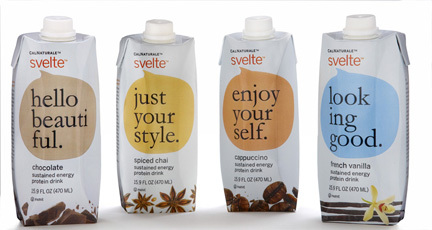 Available in four different flavors – french vanilla, cappuccino, chocolate, and spiced chai – the new Cal Naturale Svelte drinks are bringing something new to the table of energy drinks. First and foremost, they are non-dairy, gluten free, have an organic soymilk base, and are made with all-natural and more than 85% organic ingredients. 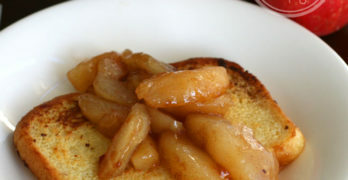 In addition, CalNaturale Svelte has 16 grams of protein and provides 32% of your DRV of fiber per serving. This was great for WiC Chick Leilani and her family, who are a vegetarian/vegan family and need to be conscious of getting their needed protein in a manner that suits their diets. 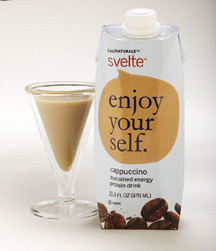 Leilani and her family sampled the CalNaturale Svelte energy protein drinks and found that they all had their own favorite flavors – some preferred the chocolate, others the cappuccino. Leilani’s favorite flavor was the spiced chai. Spiced chai is a fairly exotic flavor and may have been risky to use in an energy drink, but it totally worked for her. Leilani thought the CalNatural Svelte Spiced Chai had a great flavor that reminded her of drinking chai tea. Certified organic and providing tons of protein and fiber, in easy to carry Tetra Prisma containers (which are eco-friendly and recyclable,) Leilani says that these are great drinks to help give you a between-meal boost. A delicious and flavorful energy drink (that only has 9g of sugar,) CalNaturale Svelte fits the bill for a natural and nutritious energy drink. If you are a vegan or vegetarian (or even if you aren’t,) Leilani is sure that you will love CalNaturale Svelte. Giveaway ends at 11:59 PM EST, November 23, 2010. Disclaimer: This post consists of my (and/or fellow tester) opinions only. Your experiences may be different. No compensation was given for this review/giveaway. Leilani did receive a free product from the manufacturer or their representing PR agency to use and test for the purposes of this review. This did not affect the outcome of this review. I’d like to try the cappuccino. Then the French Vanilla. Then the chocolate. Well, they all sound yummy! I would love to try the spiced chai! Chocolate is my flavor of choice! I want to try chocolate first, then cappuccino.